Recorded in the first three months of 2003, Spring has Come was developed with the coming of Rabi al-Awwal and the Milad-un-Nabi in mind. The nasheeds therefore have the Blessed Prophet as their theme; some directly such as the Urdu classics Makki Madani (O one from Makkah and Madinah) and Hazoor Agaey Hein (The Prophet has come), while others like the title track Spring has Come allude to him and his mission. 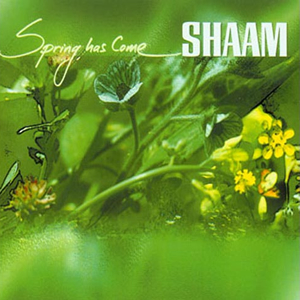 All four English songs were written by the group and each is layered with fantastic harmonies and rhythmic drum patterns – the hallmark of SHAAM. Signs in particular, co-written by Yasin Alam and Executive Producer Tayyeb Shah, is both catchy and deceptively profound. Subhan Allah (Glory be to Allah) has an infectious beat, while the words outline the five pillars of Islam – children will find it particularly enjoyable and educational. SallAllahu a’la Muhammad (Blessings of Allah be upon Muhammad) takes a classic Arabic nasheed and transforms it into a great, rousing English song, translated and adapted by Mahmud Norris. The Arabic tracks Antum Muradi (You are my desire) and especially Salawaat (Peace and Blessings) meanwhile serve to remind the listener how effortlessly SHAAM can switch between languages and between traditional and contemporary styles of rendition. The runaway success of Mercy like the Rain meant there was pressure to deliver and match that achievement with their follow-up album. So less than six months after having completed Mercy the guys were back in their Coventry studio. Haroon again took up the mantle of producer, ably assisted by sound engineer Darren Wood. Mahmud worked and re-worked the melodies and harmony arrangement to ensure they blended well with the drumming and vocals. Imran and Yasin joined in the development of the harmonies and production. The end result is an album that is spiritually uplifting and contemporary. It certainly builds on the foundation and reputation of Mercy and, dare one say, surpasses it. Time will tell if it becomes as successful but the signs are very good. seal of the prophets of Allah, Muhammad and upon his family and companions – may Allah’s peace and blessings be upon them all. Our families for their continued support & prayers; Tayyeb Shah; Aflak Suleman; Ergin Mahmout; Omer Gokalp; Andrew Sparkes; Osama Osman; Muhammad Akram Khan; Fadi Itani; Firdous Zahoor; Khaleel Muhammad; Javed Bostan; Abdul Kader Gooljar; Mustafa Evans; Yusuf & Ahmad Muzarze; M Yamin Makri; Tarik al-Satari; Azhar Usman; all from ISB, YM & YMO; all the radio stations who play our albums, especially the Radio Ramadhan stations in Luton, Sheffield, Oldham, Glasgow, Rochdale, Bradford, Peterborough, East London and Birmingham; and finally all the brothers & sisters who have bought our previous albums & those who have invited us to their events & functions enabling us to spread & develop the art of nasheeds & benefit the Ummah.